Welcome to the Black Hat Asia 2019 Resources page. We have provided information and collateral to help make your experience at Black Hat a successful one. If you have further questions or need anything contact blackhatregistration@ubm.com. To stay up-to-date on event announcements, schedule changes, and more, follow official Black Hat social media channels and hashtags. Post using the hashtags below to join the conversation. 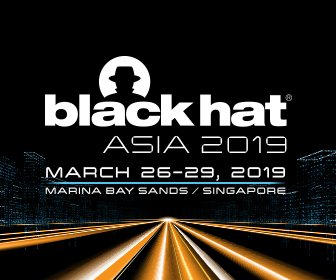 Black Hat Asia 2019 offers 2-day and 4-day Trainings, plus a 2-day main conference of Briefings, the Business Hall, Arsenal, Business Hall Sessions and more. Determine the best pass type using the pass comparison chart. Black Hat Asia 2019 will be held at the Marina Bay Sands Resort in Singapore. For exclusive rates at Marina Bay Sands and nearby partner hotels, visit the Official Black Hat Travel Page. 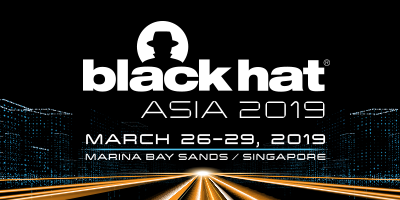 Use the Schedule-At-A-Glance to begin planning your time at Black Hat Asia. This schedule provides an overview of the weeks events. From there you can click-through to each programs specific schedule. Make sure to download the Black Hat mobile app when it becomes available. The Source of Knowledge will be on-site to sell audio and video recordings of the Briefings sessions. Make sure to purchase the media on-site for a substantial discount. Briefings recordings can also be purchased online via www.blackhatbriefingsonline.com or sales@sok-media.com. Official recordings from Black Hat Briefings are uploaded for public viewing 90 days after each event. Find Briefings recordings on the Official Black Hat YouTube Channel. Black Hat branded merchandise is only available on-site at Black Hat Events. Get your Black Hat branded T-shirts, hoodies, gifts, and more in the Merchandise Store, located in the Business Hall. Trainings and Briefings passes include lunch during each day of the conference. A wide variety of restaurants and additional dining options are easily accessible at the Marina Bay Sands Shoppes (within the Convention Centre). We believe our community should be truly open for everyone. As such, we are committed to providing a friendly, safe and welcoming environment for all, regardless of gender, sexual orientation, disability, ethnicity, or religion. The code of conduct outlines our expectations for participant behavior, as well as the consequences for unacceptable behavior. Please review it prior to coming on-site here. Black Hat Asia returns to Marina Bay Sands in Singapore, March 26-29, 2019 with multiple 2-day and 4-day technical Trainings, plus cutting-edge Briefings, the Business Hall, Arsenal open-source tool demo area, and more. 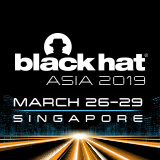 Black Hat Asia returns to the Marina Bay Sands in Singapore, March 26-29, 2019. InfoSec professionals from around the world will gather for a range of highly technical Trainings and thought-provoking Briefings. Multiple 2-day and 4-day courses open the show, followed by two-days of the main conference, March 28-29, featuring ground-breaking research presented in Briefings, leading security solutions and products in the Business Hall, and innovative, open-source tool demonstrations at Arsenal. Network with the industry's top talent and stay up to date on the latest vulnerabilities, disclosures and in-demand security skills. Please add a banner to your website, blog, signature, etc. to let people know you'll be attending Black Hat Asia 2019. If you need a custom banner or permission to use the artwork for another purpose, please email BlackHatMarketing@ubm.com.